Who knew that finding alcohol could be this hard ! My little sailboat Madsu has a non-pressurized alcohol stove made by Origo. I love the stove – it’s super hot, needs zero maintenance, and compared to pressurized gas, is super safe. The stove is responsible for making coffee, hot water for shaving, and all my cooking that isn’t BBQ; in short, one of the most important items on the boat ! Up until this year, I’ve been able to buy denatured alcohol for the stove at one of my local hardware stores – Rona used to stock it with solvents and turpentine – and it was relatively cheap. It was simply called Denatured Alcohol – a no brainer. This year, I haven’t been able to find it anywhere. So, I did a quick crash course on alcohol for stoves. A search on the web shows that other people in Canada have trouble finding denatured alcohol. Other than for use in stove, apparently bike folks use it to clean gears etc. Denatured alcohol is Ethanol – grain alcohol that’s been treated to make it undrinkable. It burns super hot and while not great for the environment, burning it is slightly LESS bad that burning other types of fuel. Most places I went to looking for this fuel, including my local marine store (Martin Marine in North Vancouver) sell Methyl Hydrate, which will also work in the stove. Methyl Hydrate is wood alcohol – if you’re old enough you probably remember using it in Bunson Burners in high school chemistry. In any event, I was bent on finding denatured alcohol rather that burn methyl hydrate. I thought I had found what I was looking for over at West Marine. They sell something called blue flame stove fuel, and though there was very little information on the bottle, I assume this is some type of ethanol mix. I almost had heart failure when I picked up the small bottle (less than a litre) and saw the price tag: $30.00. Burning EverClear would be cheaper. 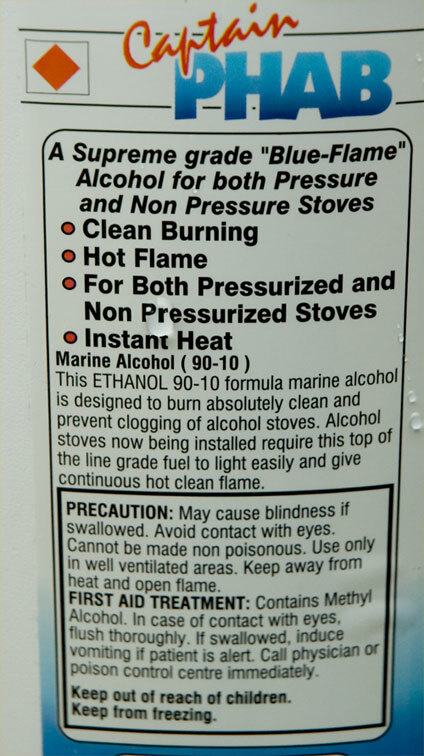 Meanwhile, in the US, West Marine sells a gallon of “soot-free alcohol” for 29.00 ! I’d almost given up, when I stopped by Steveston Marine just off Granville Island. They now stock something called Captain PHAB Marine Alcohol, from a Peterborough Ontario company, Captain PHAB. It sells for $19.99 for a 4 litre bottle (that’s 1.14 gallons) and it’s a 90-10 mix (Ethanol and whatever they use to make it undrinkable). The staffer told me that one of the reasons denatured alcohol has been hard to find is that one of the main suppliers either went out of business or stopped carrying it. So, for all you sailers, campers and bikers – try Steveston Marine in the lower mainland, or check your local marine store and if they don’t have it, get them to order it for you from Captain PHAB. As for me, I’m heading down to the boat right now to fill up my stove and perk up a pot of coffee. I’m so damned pleased with myself, I might even shave. You’ll see that Steveston Marine has moved their Vancouver store because of redevelopment of their old (awesome) location – it’s still nearby, over at 1667 West 5th Avenue, Vancouver. I new location will be a lot better once the construction around the corner is finished – right now using the backlane to access their free parking is a nightmare as there is only one way in /out. I have found denatured alcohol at jeweller’s supply stores recently. Here in Montreal, Canada, it costs 6$/liter or 15$/gallon. Hi. I bought it at Unitec import inc. It is more precisely “Methanol” lab grade. I remember buying 4 litres of Methyl Hydrate (for my Origo stove) in Quebec city in 2007 for $6.75 . The greedy b*stard retailers have “jacked” the price up to $12.00 for 4 litres here in New Brunswick. Retailers are the thieves that ruin the economy , no doubt about it. Their greed outdoes their brains. They take away all semblance of happiness in the lives of everyone and are NOT CONTROLLED BY ANY GOV AGENCY. I wonder what el-poo-poo toro excuse they have cooked up for that price hike. Methanol and Ethanol are certainly not chemically the same. Ethanol has a higher BTU output. Product has gotten expensive – here is why. Not enough buyers. We buy Ethanol in the 5 gallon pails. The manufacturer makes a few bucks and the distributor makes a few bucks. We put it into smaller containers. The containers cost probably more than the fuel. Given that most people will not use a gallon a year the cost is not that bad. On top of that someone needs to drive around and pick it up then repackage it then ship it. As an interesting note, even lab grade Ethanol is considered a waste product as it dilutes any dense oil product like diesel or gasoline. One of our clients is a waste management company and they get pallets of Ethanol, Methanol, and Propanol. Hey, where is tacticalmountain at? If in Calgary, shoot me your address and I’ll drop by. It is measurably better than methanol. OK, so indeed, they had it in the store. 4L for $16 and 1L for $8. Thanks so much for the find again. A friend of mine also recommended to get a bottle of methyl hydrate from Canadian Tire or Home Depot – paint section. That is even cheaper, burns great but does not have the blue colouring of the Captain PHAB, which left some blue residue in my stove after burning. Both work great for any alcohol stove. Many thanks! I should have googled first – I made the mistake of assuming it would be around in any hardware store. This may be more than just getting more heat for the same weight and volume; a stove designed for ethanol may run sub-optimally on methanol. The sizes of the holes from which the vapour comes out may assume a certain amount of flame will be produced, enough to keep the alcohol below vaporizing at the right rate. Most stoves run OK on both – just better on ethanol. For me, it’s just about my tea boiling in 7 minutes instead of 10. PS: Your “10%” is almost certainly methanol – the denaturant of choice, one of my googles claimed. I guess Da Man would prefer that bums and other cheapskates actually DIE and thereby learn not to get around the liquor taxes, not just have to learn how to choke down a gross flavour. Actually, the label on the photo of the bottle explicitly says that it is methanol that is the denaturing agent, so you’re right. As for why governments would require alcohol to be denatured with something which can cause blindness, this seems to be both a vestige of our past extreme intolerance of intoxication and our toleration for central government over-reach. But that is another question! Calgary is a good place to find chem-lab materials, there are a lot of labs in town via the oil industry. So lab ethanol runs a mere $14/litre. Meanwhile, my fruitless searches around hardware stores and so on led me to prices like $8.99 for four litres of methanol. Paying SIX times as much for about 30% more energy value per millilitre doesn’t really pass the common-sense test. If you’re on a long trip and need to carry a lot of fuel, you’re also running into the calculations that point out the choice of any alcohol stove at all is a bad weight decision; so much more power in isobutane that it pays for the weight of the cannister and heavier stove once you get past 6-7 days of cooking. I frankly doubt I’ll be on a lot of trips even that long; for me, an alcohol stove was a way to carry a SECOND stove along and not be trapped in the “linear cooking” problem where you can only make one thing at a time and heating coffee or just wash water had to be done after you’d finished supper. It’s cool to have a 1-oz stove and say 8-oz of fuel that allows for rice to be cooking while I make stew; but cooking that rice a few minutes faster just isn’t a good enough reason to go buy lab supplies. Sigh – if we had a rational approach to drugs, starting with alcohol, then pure ethanol, also handy for drinking if you didn’t need it for your stove, would be in the 4-L jugs next to methanol, for maybe $9.99 for four litres. Or less – it sure costs less when used for cars! Just wanted to say thank you for your diligence! I’ve been contemplating switching to an alcohol stove for bicycle touring. I’ve also been stumped trying to find Denatured Alcohol in Barrie, Ontario. I struck out at the local big boxes here. Rona sells 1L of Methyl Hydrate for $4, 4L for$10; Home Depot sells theirs for 25 cents more. Lowe’s doesn’t carry any Methyl Hydrate. The next step is to check if this can be special ordered. Not sure if it’s carried by West Marine stores in Ontario, but I have seen other Klean Strip products carried by the big boxes listed above, so it might also be a product that can be stocked/special ordered. If that fails, there is a local marine supply store, Brydon Marine, that is listed as a Captain Phab retailer. I’ve got a call into them, but haven’t heard anything back yet. The last alternative is Home Hardware and their Fondue Fuel. At $2.19 for 500ml, it still works out to about $17.50 for 4L. Thanks again for broadcasting the word out to the world! It seems that not all denatured alcohols are created equal! I also called the local Lowe’s and Home Depot and they won’t special order any Denatured Alcohol. No word on Rona, but I have no faith that the answer will be any different. I’ll let you all know what I find. Thanks again. Not the cheapest, 5L is $30, but easy to find. There are other manufactures out there such as http://www.blomus.com that use the same. A friend of mine mentioned she was at someone’s house who has one of these as well, and I had asked her to find out from them where they were getting their fuel. But you beat them to the punch. Thanks for the info ! I use DNA in model building. I was lucky that my wife, a biologist, had access to lab supplies. But the stocks are running low now and I checked Recochem’s BioFlame fuel for ventless fireplaces. Go to https://nt9.magma.ca/recochem/consumers/consumerLogin.asp and use MSDS for username and password. Then search product 14-414. You will find Bio-Flame (as sold at Rona/Reno-Depot). MSDS available in Fr and En. From what I read, correct me if I’m wrong, it is a mix of DNA and Ethyl Acetate. On the packaging it says “Ethanol and Isopropyl alcohol”. Been looking everywhere for DNA in Ontario with no luck. No one has it, and they all try to sell me methanol instead despite my telling them its not the same. I just checked your link Marc-Antoine and tried searching for Bio-Flame on Rona’s site with no luck. Plus I’ve never seen it there when searching their BBQ section (where I’d expect to find it). Gonna grab a gallon next time I cross the border. Anyone think there’d be any issues bringing it across? Bio Flame is carried by Canadian Tire. $24.99 for 3.78 litres. 99.9 % pure Methyl Hydrate at Canadian tire for $10.29 for 3.78 litres…. Any Home Hardware store should be able to special order denatured alcohol for you. Only thing is they don’t call it that. They call it marine alcohol. It’s a 90/10 mixture and it sells for around 32$/gallon. Denatured alcohol is available on Victoria in the Capital Iron store (3L /$20) and they will send it to the Sidney store if requested. Hope this helps. Jensen Marine on Tyron Road sells PHAB marine alcohol for 8.25 for one litre. Thanks Susan, that’s great info. Love the Capital Iron store, wish we had something like that over here in Vancouver. That’s a great price for 3 litres, will pick some up next time I’m over on the Island. For anyone who’s never been to the Capital Iron store in Victora, you’re missing a real treat. Book a few hours off if you’re planning on visiting. Their website doesn’t really do the store justice, it’s an incredible place. we want denatured alcohol 99% to be used in hospitals and cosmetics. we will buy 16000litres packed 250litre drum to fit a 20 foot comtainer. we want c&f Tema, Ghana. Did you ever find your denatured alcohol from Canada for delivery in Ghana and use in hospitals and cosmetics as you mention??? Where are you located? Google Greenfield Ethynol. They sell it cheap and in bulk. You’ll probably need a liscense to buy 99% pure though. If you are in medical field, this should not be a problem. They sell it at 3.60$ / Litre. It’s super cheap. I have been looking hi and low for denatured alcohol and of course it doesn’t seem to exist in Canada. So I tried the recommended Captain Phab marine alcohol unfortunately none of the marine stores in Calgary carried it. Among all the places that I had called, only Glenmore Boats offered to bring some in for me. It would cost $22.99 for a liter (Ouch!). As a results I set my mind on Bio Flame Ethanol fuel suggested by Marc-Antoine. Called The Bio Flame Calgary store and they had 4L for $25.00. Currently out of stock plus a long drive to go all the way to the SE. Then I noticed Terrence’s suggestion – Canadian Tire. Never in my life thought Canadian Tire would have something useful but I gave them a call anyway. Sure enough, they had the 3.78L for $24.99! By the way, the Bio Flame Ethanol is 88% alcohol, not quite 90%, but close enough. I am happy to have found some in Calgary. It’s been a real PITA trying to find something for my camping stoves. Thanks for all your contributions. Now I can finally be camp happy! Cheers! thanks for letting us know – it’s incredible how complicating a simple thing like this can be – or at least if you won’t want to get hosed (22.99 a litre – ouch). Why is everyone paying so much for fuel for their alcohol stoves? Canadian Tire has 4 liter jugs of Methyl Hydrate for around 8 $, you can find the red/black/white jug but they also carry a blue/white jug in the car section, Certified-brand air brake antifreeze, for even less… Been using that one in my Whitebox Solo stove, and it works flawlessly! As mentioned above, it burns hotter can contains more energy per unit weight. For hikers, this can be a bit of an obsession. (Check out mountain equipment co-op for, say, “a titanium spork” that allows you to leave the fork at home and save 10 grams on the weight of your spoon). But the larger thing is that some of these stoves, you can’t add fuel to while it is burning. So you can either make two cups of coffee with methanol, or three with ethanol. Period. If you’re cooking for three, it means you don’t have to take turns! Ahh the obsession. You are bang on except its cool to carry a titanium spork! To your point on adding fuel. I think that the Esbit stoves and wood stoves are the only ones you can add fuel to while they are burning. If you have a lot of time you can use these alcohol stoves for more than one person but at room temp it is almost impossible to bring a litre pot to a rolling boil. It takes about 6-7 minutes to boil 2 Cups of water (at room temp) and the stoves hold about 15 minutes of fuel. Interestingly, the stoves work really good when you use a Primus ETA express pot and try to boil larger amounts. I started carrying Fuel on our website. I am buying it in 5 Gallon drums. If you need it I’ve got lots!! Its on on website too in 8oz Vargo fuel bottles! Trangia’s are great. Canteenshop is great! I really prefer ethanol over methal Hydrate even though it is more expensive but I use what ever is around!! Just ordered a couple 8oz to try out, thanks. Craig, can you email me prices for larger sizes? I cant find the previous email from my order. Thx. Just went to Canadian Tire yesterday, found methyl hydrate in the automotive section, $9.99 for 4 liters, easy peasy. I actually am looking for it to cut dye for leatherworking, as I don’t really want to be spraying Methyl hydrate or isopropyl out of the air brush, and ethanol is much better for this anyways. Many thanks to everyone….I needed methalyted spirits for a recipe to clean and preserve antique hand tools, that I got from an antique tool dealer in the U.K. where m.s. is used freely…..even in schools….!! So it’s the best we can find near DA here in canada the BIO FLAME Ethanol ? cleaning the tape-heads in my cassette deck. I am looking for alcohol without colorent, it needs to be transparent. I draw with high grade markers and they sell some no color marker a 3$ but they don’t last long and i know inside is nearly pure alcohol without colorent. The marien alcohol you talk about, is it transparent or does it have colorent, i check on the net and all the botlle are opaque? When I lived in the Vancouver area, I found that I could buy a large (approx. 1 litre or more) bottle of “Everclear” brand alcohol from one of the duty-free stores at the Blaine border crossing (the “truck crossing”) when driving from Washington back into BC. This is 190-proof alcohol (95% ethanol, 5% water) that you could safely drink after diluting it somewhat – no methanol, isopropanol, or other denaturants added. The price was comparable to other liquor, perhaps $20-25 for the large bottle. I use it as a solvent, not for a stove, so one bottle would be a lifetime supply for me. Unfortunately, I couldn’t ship it with the movers when I moved to Ontario, and you can’t legally carry open drinkable alcohol in the car, so I had to give it away. The one source I’ve found so far in Ontario: Sayal Electronics sells a bottle of Asalco AE-104 “Head Cleaner” that lists only ethanol as an ingredient. It’s expensive for a little 125 ml bottle. That would clean a lot of tape heads or electronic components, but wouldn’t give you many fills of an alcohol stove. The liquid is clear. The denatured alcohol I bought from Craig is clear and burns well. The price is fair for the volume including the container. I buy “exact” brand “rubbing alcohol compound” from superstore/loblaws. They only sell it in 500ml bottles but its only 2$. Ingredients are listed as: Ethanol anhydrous 95% Denatonium Benzoate, Diethyl Phthalate, Camphor. that’s fantastic – I thought that my rubbing alcohol was isopropyl alcohol – and double checked – it’s Exact from Walmart – 95% ethanol! I think that would be fine for general cleaning. But I probably wouldn’t use it to clean a camera lens or to thin shellac unless I knew that the non-alcohol ingredients evaporate without a trace, and would not affect the finish chemically. For use as a stove fuel, what are the combustion products of denatonium benzoate, diethyl phthalate, and camphor? 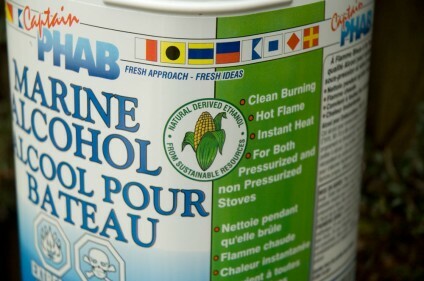 The nice thing about ethanol denatured by adding methanol is that it’s 100% alcohol, both ingredients evaporate completely, and both burn cleanly in a stove flame. Just picked up another 4L jug of methyl hydrate at Crappy Tire, $10. Another advantage apart from the energy content of denatured alcohol (DNA) versus methanol is the toxicity. For cooking appliances and camping this is an important consideration. Methanol (of Methyl Hydrate) is extremely toxic and is absorbed easily through skin. DNA in general is is therefore a safer fuel in terms of toxicity. Not all DNA is the same, however. The most common denaturing agent in DNA is usually methanol, but10% concentration is better than 100%. The bio flame DNA uses 2-propanol (isopropyl alcohol) which is much less toxic than methanol and will not poison you by mere skin contact. IMO bio flame (or similar) is the best choice after pure ethanol (190 proof or 95%) for cooking or camping. The problem with pure alcohol is that in Canada it can only be bought in Alberta (190 proof Everclear) or Quebec (94% grain alcohol) at about $65 a bottle. Not many bordering states allow the sale of 190 proof alcohol (Montana is one). Only about a dozen states actually sell the stuff. I have a little stove that only use methyl hydrate, my friend gave it to me years ago, I found we are having more black outs and this is perfect for boiling water or heating up a can of something. It is getting a little rusty and I would like to purchase another one but I cannot seem to find one not even online. Do anyone know where I may find one? Appreciate it. I did a lot of research as like most people I had no luck finding denatured alcohol, called for in many aspects of woodworking. Finally found it. In Lee Valley, in Toronto. Problem was it is not listed in their catalogue, print or on line, as denatured alcohol. They have a product called “Shellac/Lacquer Thinner” According to the label it contains Ethanol, Isopropanol, and Isobutanol. Which according to my research is one version of denatured alcohol. Caution: Not all Shellac/ Lacquer thinners have the same composition. For those who don’t know Lee Valley is a small chain with stores across the country. All I’m trying to find is a small amount of denatured alchol to mix with pure white shellac (also try to find this in Canada!!!!) for finishing my pine needle basketry. I’m in Kamloops, BC, can anyone help me PLEASE!!! yes Lee Valley sell it. They don’t call it denatured alcohol so you wont find it in the catalogue, I believe it is called Shellac thinner or something similar, if you check the ingredients, it is denatured alcohol. I found it in the Toronto store, but all their stores should have it. I too am looking for DA for the purpose of dissolving shellac flakes so I’m not concerned about it’s properties as a fuel. Do you know if the LV stuff is suitable for that? Scuplture Supply Canada carries a denatured 99% Ethanol (no brand) that’s $22.79/gal. used for alcohol torches. SSC is in Ontario, but maybe you have a closer (sculpture or art) supply store that will carry it. Amazing! I just ordered a one gallon jug and will be picking up on Saturday for use nn my Origo alcohol stove (marine). Thank you for posting that info. Just thought that I’d share what I found. A company called Greenfield sells methylated ethanol for about 3.60$ a litre (13.60$ / gallon) in Boucherville, QC. That’s just on the outskirts of Montreal. They have sellers all over Canada. They sell a 85% ethanol, 15% methanol blend. The methanol is added so that that it cannot be drunk. Plus there is 1% acetate. The acetate makes the flame visible (blue) and gives it a small odor to discourage drinking. The minimum you can buy is 25 liters. (6.6 gallons). I’ve looking for ethanol to make gel feul for my BCB Crusader camping stove and stumbled on them. Thank you so much, I called them and the price is awesome!!! I buy methyl hydrate from Lordco in Victoria BC at a reasonable price. “Methyl hydrate is also known as methanol, methyl alcohol or wood alcohol. Denatured alcohol is almost pure ethanol, also known as ethyl alcohol, plain alcohol, grain alcohol, moonshine or sippin’ whiskey. Stuff is added to ethanol to make it either distasteful or poisonous to make it denatured. Sometimes, and there are dozens of ways to denature ethanol, methanol is added to ethanol. This makes it poisonous. Methanol is highly poisonous and is rather readily absorbed through the skin while ethanol is only moderately poisonous and not as easily absorbed. Consuming methanol will lead to blindness, convulsions and death at a fairly low level of consumption. Methanol is also more flammable than ethanol. It is therefore not a good substitute for denatured alcohol. Chemically methanol has 1 carbon, ethanol has 2 carbons and isopopyl alcohol has 3 carbons. Flammability goes down with increasing carbon content because volatility also goes down with increasing carbon content. I have an origo stove and a pressure alcohol stove. Whenever I used anything with methyl hydrate I suffer breathing problems and my eyes hurt. Does that happen to anyone else? (taken from another source): “Methyl hydrate is also known as methanol, methyl alcohol or wood alcohol. Denatured alcohol is almost pure ethanol, also known as ethyl alcohol, plain alcohol, grain alcohol, moonshine or sippin’ whiskey. Stuff is added to ethanol to make it either distasteful or poisonous to make it denatured. Sometimes, and there are dozens of ways to denature ethanol, methanol is added to ethanol. This makes it poisonous. Methanol is highly poisonous and is rather readily absorbed through the skin while ethanol is only moderately poisonous and not as easily absorbed. Consuming methanol will lead to blindness, convulsions and death at a fairly low level of consumption. Methanol is also more flammable than ethanol. It is therefore not a good substitute for denatured alcohol. Yes, denatured is more expensive, but less toxic. Thanks for the great blog! This is useful for jewelers too! I picked up a “natural” perfume reccently and noticed that they use “dentured alcohol”. I assume the alcohol is mixed with essential oils. Reading some of the comments about its cancer link I’m now worried to use it! Any thoughts on this? Has anyone ever heard of Dentured Alcohol in a perfume? “Denatured” just means that something has been added to the ethanol to make it undrinkable. There are dozens (if not hundreds) of substances that can be used for this purpose. I have to assume that alcohol used in perfume making would be denatured by some substance that is safe to apply to your skin (in fact the essential oils themselves might qualify as a denaturant). I can’t imagine any responsible perfume maker using methanol-denatured alcohol, since methanol is toxic and absorbed through the skin. The Home Depot in Niagara Falls NY sells it by the gallon of the Klein brand. It is very expensive $23 a gallon plus shipping. Looking for an equal substitute in western canada for cheap. Thanks. Home Hardware has Bio Flame Ethanol Fireplace Fuel. $8.99 for 946ml. 1L bottles of DNA are available from Ardec in Quebec for $13. I live in BC and I just purchased some denatured alcohol at Ace Hardware in the Lower Mainland. The brand is Klean strip and it was $8.50 for a quart. They also had a larger size . Ace Hardware has locations scattered across Canada.